The 37th Annual General Meeting of the WCCS was held at Life University, Atlanta, USA from 3rd to 9th April 2015 and this year NZCC sent 5 delegates to ‘Hotlanta’ – Holly Davies (2nd year), Alyshia Turner (2nd year), Jenna Salmons (3rd year), Nick Ujdur (3rd year) and Ali Schwarz (1st year graduate). This team worked hard to represent the values that NZCC holds dear and to fulfil our own vision to “inspire and strengthen the unity of future chiropracTIC leaders with humility, passion and grace.” I’m proud to say I believe we achieved this. The format for Congress this year was slightly different with the AGM being held at Life University campus instead of the hotel. It was also the first year that an official alumni event was being held and incorporated into the AGM. This was a great experience for all delegates as we were able to interact with these previous leaders of WCCS about life after WCCS, life after school and how to integrate it all to become a better chiropractor and leader. Our first day was full of activities that promoted team building and took place on campus. The activities also promoted self-reflection on how the lessons learned, during the activities, could be incorporated in life – both personally and as a chiropractor. This was followed by a tour of the Life campus and what a beautiful campus it is! From the epigrams on the walls, to the relaxing woodland walks to Lyceum Park and the statue of an incomplete safety pin, the spirit of vitalism and chiropractic was encompassed and the vision of what Life University is trying to achieve is obvious. Congress kicked off with old business and voting in two new member colleges – Chiropraktik Akademie in Germany and Texas Chiropractic College. From there, the momentum of the AGM grew in passion and unity. 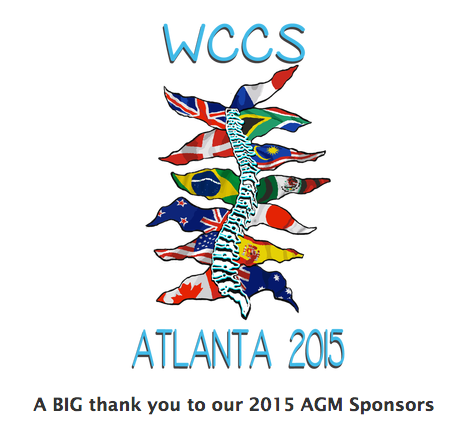 This year was also the first time the WCCS AGM was webcasted to include those who did not attend Congress. There were 9 proposals this year and 6 discussion topics. The 2015 NZCC proposal of generating an online calendar to facilitate different WCCS chapters around world to skype in on each other’s meetings was very well received. The proposal was passed quickly and unanimously, and is now live on the WCCS website. Again, the theme of the proposals was to streamline WCCS activities and increase communication between its members. The discussion topics demonstrated that the power of WCCS is in its members ability to respectfully collaborate for a common goal regardless of individual view points. These included: the Annual Collective Focus, the new GCC testing procedures, health promotion versus disease prevention, the external perceptions of WCCS and how to change these and how WCCS can obtain its own seat/representation at the World Health Assembly (WHA). But the most poignant discussion was around the European Council on Chiropractic Education (ECCE) and it’s accrediting processes. From this discussion, WCCS wrote a letter to the ECCE applauding its efforts in keeping accreditation standards high but also recognising that a chiropractic college’s competence does not hinge on philosophical differences and that accrediting procedures need to be consistent from school to school. To have the letter written and unanimously passed in a few short days is a testament to WCCS’ vision of unity and what can be achieved when we drop the ego, recognise our commonalities and subscribe to a vision bigger than ourselves. Congress sessions were broken up speakers and delegates were privileged to hear from Drs Roy Sweat (Atlas Orthogonal developer), Guy Riekemen (President of Life University), Jeanne Ohm (paediatrics), Greg Stewart (President of the WFC), Ron Kirk (Straighten Up America), Liam Schubel and Jay Komarek (animal chiropractic). Our own Jenna Salmons brilliantly presented her research regarding the effect that chiropractic care has on pelvic floor muscle contraction and the interest in this was great. Policy and Procedures Committee and also on the Consensus statement panel. of the International Mobility Committee. She is also part of the WCCS strategic planning team for the WHA, the ACF liaison and the chair of the International Mobility Committee. With curiosity growing about the New Zealand College, Holly Davies presented and won the bid to host the Western Pacific regional event in 2017. This will be an incredible event for all students in our region to attend and a great way to show off everything that NZCC has to offer. Holly is also a member of the International Mobility Committee and the Community Humanitarian Assistance Program (CHAP) committee. This year, the social activities included a visit to the aquarium, a cowboy-themed BBQ, being on court with the NBA team Atlanta Hawks, a visit to the Carrick Brain Center, the closing gala night and a billet night. Billet night involved students and faculty hosting small groups of students in their homes. Our delegation got to have dinner and intimate conversations with the likes of Drs Gill Lemarche, Greg Stewart, Guy Riekeman. What an opportunity for our students to mingle with these movers and shakers of the chiropractic profession! The underlying theme of the WCCS AGM this year was leadership and never has it been so clear that the future leaders of the chiropractic profession sit in these WCCS AGMs year after year. BJ Palmer said “we never know how far reaching something we may think, say or do today may effect the lives of millions tomorrow”. I believe this is true of WCCS and I look forward to the next few decades to see how the strategic planning, the work done and the relationships formed at the 2015 Congress, effect and shape this wonderful profession for future generations of chiropractors.